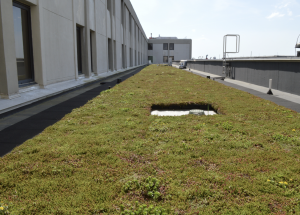 At the Ralph H. Johnson VA Medical Center in Charleston, a modular green roof system was installed to improve the quality of life for patients in the extended care wing. Michael Whitfield was fascinated by the concept of green roofs, but he didn’t encounter many of them near his home in Charleston, S.C. 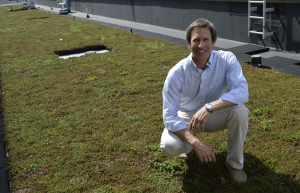 He knew green roofs benefitted the environment, extended the life of roof systems and were aesthetically pleasing, so he was sure he could tap into the market in the Southeast as a green roof installer. When he couldn’t find a modular green roof system he liked, he designed his own. Whitfield is now the president and CEO of Green Roof Outfitters. Founded in 2009, the company manufactures components for green roofs installed all over the country. The company also installs green roofs itself, as was the case with a nearby hospital project. After reading research studies that showed hospital patients recovered more quickly and needed less pain medication when they had a natural setting to look out on, Whitfield was inspired. He checked with local hospitals to see if there were areas that would be good candidates for green roofs. When the PR person at the Ralph H. Johnson VA Medical Center expressed an interest, Whitfield passed along the research material. Months later he got a call asking him to submit a bid. While the hospital’s budget did not allow for a green roof to be installed on the entire building, there was a section of the roof that could be worked on right away. It was a 3,000-square-foot area on a wing for extended care patients, who looked out on a white TPO roof. “We put a green roof on that whole strip outside their windows so the patients would have something nice to look at,” Whitfield says. Construction took place on a weekend, when traffic would be lighter. A crane was used to load the material on the roof, including 4-inch-deep trays for the extensive modular green roof system and 2-inch-thick rubber pavers to go around the perimeter. Plants in the pre-grown mats included different varieties of sedum. Chives, prickly-pear cactus and other perennials were added later. Green Roof Outfitters partners with growers around the country to provide pre-grown mats. Different varieties of plants are used in different parts of the country, but in most markets the company has had success with a blend using approximately 14 different varieties of sedum. Michael Whitfield was on hand to oversee the project at the VA medical center. Bellaforté Slate composite roofing in Smokey Gray was installed on the 117,668-square-foot hospital. Bellaforté Slate composite roofing in Smokey Gray was installed on the 117,668-square-foot hospital. The composite roofing has achieved a Class A Fire Rating in the ASTME E 108 fire test and withstands straight-line winds up to 110 mph in the ASTM D 3161 test. 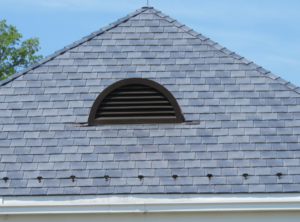 The roof tiles also resist impact, severe weather conditions and wind-driven rain. Bellaforté Slate tiles not only add safety to the structure, they also add aesthetic appeal. The 60-room hospital features eight operating rooms and specializes in outpatient and inpatient orthopedic, neurologic and musculoskeletal care. The roof was installed in May 2015.